Mary Abigail Houghton married Roy Chester Smith in Dec 21, 1921. Mary Marguerite Palmer married Ernest Orrin Houghton, son of Henry Edmond Houghton and Abigail Matilda Derby, in Sep 10, 1905 at New York, New York Co., NY, USA, JWH: 1 Sep.
Edward Algion Houghton married Edna Manning in Oct 21, 1921 at Worcester, Worcester Co., MA, USA. Edward Algion Houghton married Vera Marguerite Converse in Sep 26, 1953 at Walpole, Cheshire Co., NH, USA. Warren Selkirk Houghton married Adah Bowhay in Oct 10, 1928. Eunice Matilda Houghton married Arthur Francis Pearl in Dec 23, 1928 at Walpole, NH, USA. Amy Heath Houghton married Glenroy S. Handy in Oct 16, 1926. Everett Ernest Houghton married Esther Maud Moultrop. John Harding Houghton married Ruth Alice Warren in Mar 28, 1860 at Fall River, MA, USA. John Harding Houghton married Mrs. Phoebe A. Gillespie in 1898 mar 2 years in 1900 census. Mrs. Phoebe A. Gillespie married John Harding Houghton, son of William M. Houghton and Sarah C. Harding, in 1898 mar 2 years in 1900 census. Ellen Warren Houghton married William H. Wilson. Alice Clifford Houghton married William Sherman Phillips in Apr 26, 1893 at Cambridge, Middlesex Co., MA, USA, both age 17. William H. Wilson married Ellen Warren Houghton, daughter of John Harding Houghton and Ruth Alice Warren. William Sherman Phillips married Alice Clifford Houghton, daughter of John Harding Houghton and Ruth Alice Warren, in Apr 26, 1893 at Cambridge, Middlesex Co., MA, USA, both age 17. Wendell Houghton Phillips married Janet Pitts Russell in Nov 9, 1922 at Trinity Church, Boston, Suffolk Co., MA, USA. 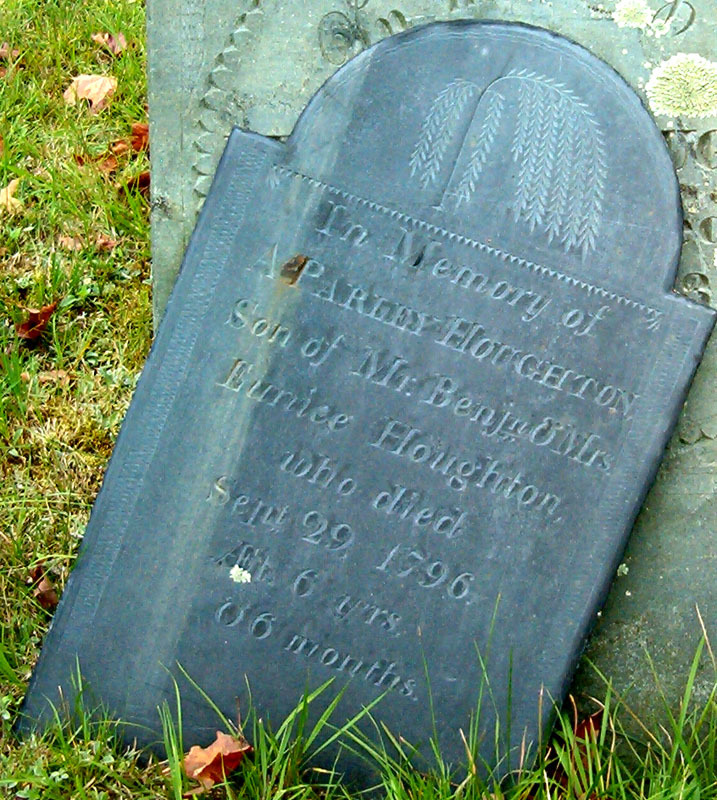 Death Sep 29, 1795 Boylston, Worcester Co., MA, USA, a. 6 y. 6 m.
Solomon Houghton and Elizabeth Pratt declared their intentions of marriage on Jan 27, 1810 Boylston, Worcester Co., MA, USA. Solomon Houghton married Elizabeth Pratt in Mar 16, 1810 at Berlin, Worcester Co., MA, USA, Bible: Mar 10, 1810; MLM: Northboro, MA per Northboro MA VRs. Cynthia Houghton married Dr. John Andrews in Feb 10, 1818 at Boylston, Worcester Co., MA, USA. Sally Houghton married Pliny Billings in May 21, 1812 at Boylston, Worcester Co., MA, USA.